They require a bit of effort, but home-made crumpets (and marmalade) trump shop-bought every time. They arrive midway through the 10-course meal in a cunning, custom-made box: plump, freshly cooked crumpets the colour of polished teak. To one side sits a dollop of cultured butter, pungent with grated black truffle. 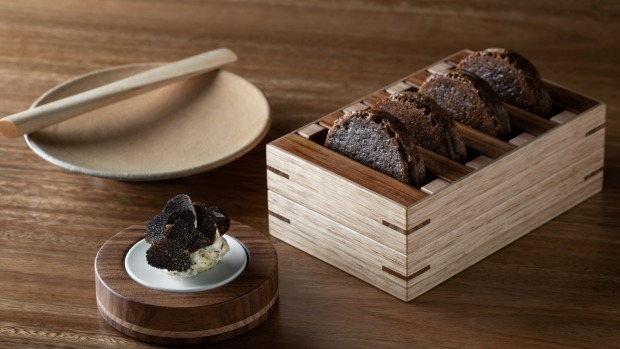 This is Peter Gilmore's take on the bread course at Sydney's newly revamped Quay restaurant, notable for both its luxuriousness and its absence of bread. It is, says Gilmore, "a pretty indulgent little course". "We'd done pikelets with yabby at Bennelong and that was a real success," he says. "I started thinking about what I could do at Quay and the idea of crumpets entered my head. I wanted to serve something that was immediate and hot – cooked at the last moment before it's sent out to the guests." Gilmore takes his crumpets seriously. He spent, by his estimation, four or five weeks perfecting the recipe, eventually settling on a mix of strong bread flour, buckwheat and roasted sprouted barley, blended with a traditional yeasted batter. "The combination of those flours give you a result that's very savoury, very toasty and nutty, and quite delicious," says Gilmore. "It has so much flavour and depth." 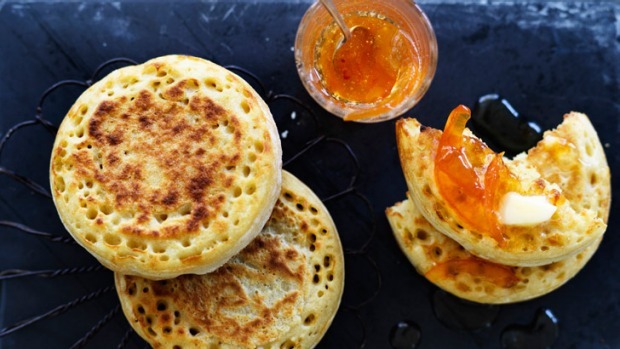 While these may be the most high-profile example of crumpets entering the restaurant scene, they are certainly not the first. In fact, crumpets – cut loose from the constrains of butter and honey – are having a moment, not only at Quay but at hotspots around the country. At Biota's recent pop-up in Chippendale, chef James Viles served them with buffalo milk curd, whipped carp and a spray of native saltbush. At Gerard's Bistro in Brisbane, they come topped with delicate pastel-hued layers of cobia, whipped roe, lemon purée, tiny orbs of finger lime and translucent onion pickled Barbie pink. With all due respect to Golden Crumpets, these are not your breakfast classics. How did it begin? Josh Niland, one half of the team behind Paddington's Saint Peter, credits Andrew McConnell with kick-starting the trend – Niland, like many, harbours an obsessive devotion to Cumulus Inc.'s house-made crumpets with whipped ricotta and rooftop honey. "Every time I go to Melbourne, I get off the plane, I go to Cumulus, and I eat the crumpet," he says. "That's standard. 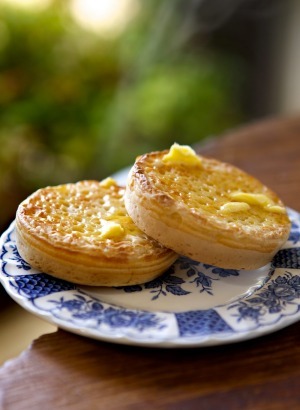 Melbourne equals crumpets equals other things – but mainly the crumpet. It's so memorable." It was Cumulus Inc.'s crumpet that Niland was thinking about when he developed his own crumpet dish, a spectacular marriage of sea urchin and a yeasted disc that's the star attraction of Saint Peter's brunch menu. The sea urchin, once scissored and cleaned, is placed back inside its spiny shell, graced with a bright scatter of chives and served atop a bowl of ice. 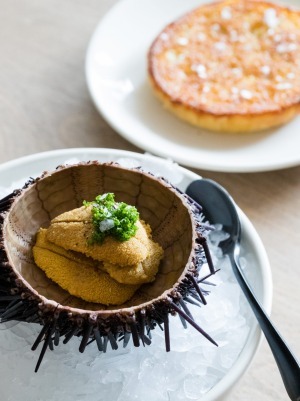 "The sea urchin is really sweet and fatty and buttery," explains Niland. Scooped out and spread on a hot, caramelised, golden crumpet, the effect is like a rich, oceanic take on the classic combination of butter and honey. Like Gilmore, Niland spent a good amount of time developing his crumpet recipe – not because he wanted to mess with a classic but because he needed something reliable enough for a restaurant service. While he has a lot of time for tried and tested baking bibles courtesy of the Country Women's Association, he ended up relying on two key sources: "I spoke to John Paul Twomey, who was at Cumulus and is now at the Carlton Wine Room, and I had a chat with my grandma," he says. "And we got there in the end." Between Cumulus Inc. and the success of wholesale crumpeteer Dr Marty, Melbourne is the country's crumpet heartland. A recent entry to the scene is at David Mackintosh's ode to bistro dining, The Mayfair. There, each crumpet arrives as a solo affair, cooked to order and placed reverently at the centre of a wide, black-rimmed plate. 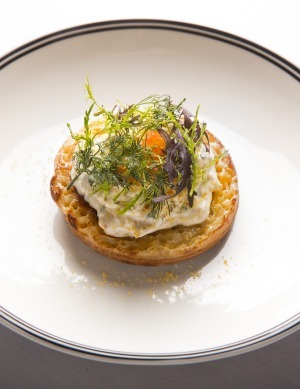 The crumpet is flawlessly griddle fried to a warm golden brown, topped with a luscious pile of spanner crab and Yarra Valley caviar, and dressed with wisps of curly parsley and a kicky hint of curry leaf. "Everyone's had a crumpet, but not everyone has had one freshly made to order and served hot," says Mackintosh. "It becomes this very luxurious thing." His vision for the crumpets, he says, was to take something familiar (to exploit our desire for nostalgic comfort food) and elevate it (satisfying our need for indulgence). This turns out to be a canny strategy. As Niland points out, almost every big food trend in recent memory has been about bringing what he terms a "chefiness" to a childhood favourite. "It's the same with pikelets or doughnuts or fish and chips," he says. "If you take these basic things and you put something very elite with them – like truffle, like sea urchin, like single-origin honey – it's like a buzzword or a trigger. I think chefs get bored and we start thinking about what we ate as kids and try to apply a little bit of thinking behind it." Asked to account for the sudden uptick of crumpets – the kind with a bit of thinking behind them – in upscale establishments across the nation, the chefs offer up a variety of narratives. Gilmore sees it as being the product of "a wave of consciousness", sort of like when Charles Darwin and Alfred Russel Wallace came up with the theory of natural selection independently and at the same time. Niland sees it as an expression of a kind of patriotism, of an attempt to carve out a uniquely local food niche. "It's nice to have these kind of dishes that are synonymous with Australian cooking because we're getting so close to attaining some kind of status in the world that we have a repertoire beyond French cuisine," he says. Mackintosh, for his part, chalks it up to the precarious state of the world. "If I can get sociological for a minute, I think people are looking for comfort. The stresses of modern life, the 24-hour news cycle, Twitter – we're in the business of providing people with a break from all that. And what could be more comforting than a crumpet?"